&Beyond Phinda Vlei Lodge is set in the Maputaland region of KwaZulu-Natal. Watch the dramatic wilderness unfold before your eyes while relaxing in your private plunge pool at this South Africa lodge. Each suite at this South Africa lodge is decorated in a subtle blend of North and West African styles with hints of Balinese influences. 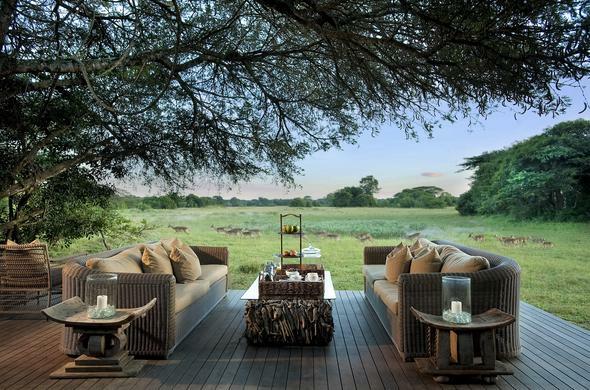 This South Africa lodge overlooks the vlei, where you are likely to see a dazzling variety of wildlife including herds of zebra and grazing antelope. The atmosphere of this South Africa lodge is exclusive and personal, mixed with style and pure luxury, operating all year round. Rare Dry Sand Forest is home to the shy Suni and Red Duiker, with the largest privately owned population of Nyala in the world. Due to this South Africa lodge being in such close proximity to the Indian Ocean, guests gain a unique opportunity to view turtles, Whale Sharks, and dolphins in one day. Guests staying at Phinda's South Africa lodge get insight into the Zulu culture, crafts, history, traditional and modern day living. Visits to local communities, bush breakfasts and romantic bush dinners add a touch of excitement. Phinda is situated in a low-risk malaria area, however you need to take the necessary precautions before coming to this South Africa lodge. Children are welcome but triple suites are not available. Regretfully children 5 years and younger cannot participate in the regular game drives. Child minders can be booked at an additional cost. Children aged 6 to 11 years are accommodated on game drives at the Lodge Manager's discretion at Phinda's South Africa lodge. Private Family safaris available.